ST. GEORGE — The West Rim Trail, including the route to Angels Landing, reopened Sept. 22 after undergoing trail repairs from a severe thunderstorm in July. Updated Dec. 7, 2018: As of this update, Zion National Park officials have confirmed that while the West Rim Trail is open, the Kayenta Trail, Upper Emerald Pools Trail, Middle Emerald Pools Trail, the terminus of Lower Emerald Pools Trail and Hidden Canyon Trail remain closed. The popular West Rim Trail closed following an intense thunderstorm on July 11 that caused flooding, mudslides and rockfalls. The heavy rainfall caused major damage in the area of Refrigerator Canyon on the West Rim Trail, which visitors pass to and from on their way to Angels Landing. A section of retaining wall failed, as did several protective check dams that were built over 100 years ago to protect the trail. The flash flood opened an 18-foot gap in the trail that was over 5 feet deep. 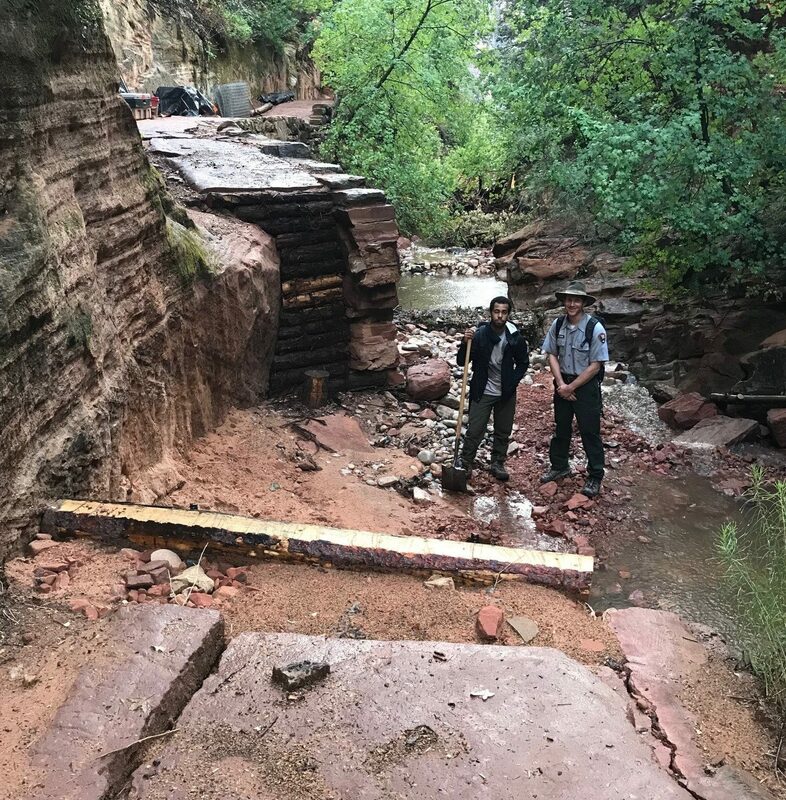 To reopen the passage to Scouts Lookout, Zion’s trail crew stabilized both ends of the trail and built a new custom bridge to span a 30-foot section where the trail and the retaining wall had been damaged or washed away. The crew also built four new check dams to protect the trail from future storms. “We appreciate the public’s patience as we’ve worked to recover from substantial storm damage, and I applaud the efforts of the park’s trail crew who worked tirelessly to re-build the trail structures through Refrigerator Canyon” park superintendent Jeff Bradybaugh said in a press release. Shuttles will resume dropping off and picking up passengers at the Grotto Shuttle Stop. The Kayenta Trail, Upper Emerald Pools Trail, Middle Emerald Pools Trail, the terminus of Lower Emerald Pools Trail and Hidden Canyon Trail remain closed. Park staff and engineers continue to identify strategies to repair or re-route the trails safely. Closures are being enforced due to unstable and unreliable trail integrity. For all alerts related to Zion National Park, visit the park website.